This user agreement conducts your use of ScrimBase as a service. Some specific areas of ScrimBase may also have terms and conditions posted which are additional to these terms and conditions. This agreement with any other additional terms and conditions on ScrimBase are referred to as this agreement. ScrimBase reserves the right to change or modify all or any part of this agreement at any time, these changes will be effective immediately upon publishment on ScrimBase. If any of these changes are not accepteable to you, you should stop using ScrimBase at whole. When registering at ScrimBase, you will be asked to input your email address, password, nickname, date of birth, gender and country. This information will be stored in your player profile which you can edit to supply more information which can be, but is not limited to name, website, games you play and also avatar and cover images. We may refuse any information you input which can be, but is not limited to content that infringes copyright, information that impersonates someone else, vulgarity or otherwise inappropriate content. Content on ScrimBase such as articles, information, graphics, links and other material that are work of ScrimBase and protected by copyright may not be distributed to third parties. Users of ScrimBase may use the content only for their personal, non commercial use. Businesses and organisations may not use information such as usernames, email adresses and other player information for purpose of sending unsolicited email and/or creating any services. You may post any content owned by you on ScrimBase, content for which you have received express permission from the owner and content in the public domain. You assume all risk and responsibility for determining whether any content is in the public domain. You hereby grant, transfer and assign to ScrimBase, assigns and licensees a fully-paid, royalty-free, irrevocable, perpetual, worldwide right and license to publish, distribute, reproduce, transmit, use, translate, display, perform, modify, revise, create derivative works of and archive the content, in any form or media now known or hereafter developed (including without limitation in print, magnetic or electronic form), on any number of occasions in any form, and to sublicense third parties to do any of the foregoing with further right of sublicense, without compensation to you. You represent and warrant that you are authorized to grant all rights set forth in the preceding sentence and that the exercise by licensee of licensee's rights under the license, shall not violate any laws, defame or libel any person, invade any person's right of privacy or publicity or otherwise violate, misappropriate or infringe the rights of any person (including without limit copyright or moral right). ScrimBase reserves every right to delete, move or edit any content that it may determine, in its sole discretion, violates this agreement or is otherwise unacceptable. However, ScrimBase does not and cannot review all of the content and material posted by users on ScrimBase and is not responsible for such content or material. You shall remain solely responsible for all material. Although ScrimBase reserves the right to remove any offending content on the ScrimBase website, you understand and agree that you nonetheless may be exposed to such material and that you further waive your right to any damages (from any party) related to such exposure. ScrimBase does not represent or endorse the accuracy or reliability of any content or material posted on any area and you acknowledge that any reliance upon such content or material shall be at your sole risk. 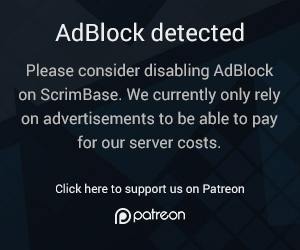 Any content placed on any area by users represents the views of the user posting the statement, and does not represent the views of ScrimBase. ScrimBase may contain links to sites on the internet which are owned and operated by third parties. 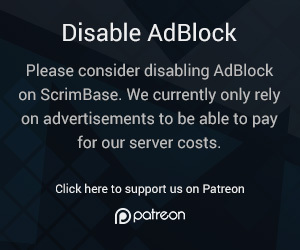 You acknowledge that ScrimBase is not responsible for the availability of, or the content located on or through, any external website. You should contact the site administrator or webmaster if you find any inappropriate external links to websites. submit material that is obscene, pornographic, abusive, harassing, threatening unlawful or promotes or encourages illegal activity. You agree to indemnify, defend and hold ScrimBase harmless from and against any and all claims, liability, losses, costs and expenses (including attorneys' fees) incurred by any ScrimBase Party in connection with any use or alleged use of the ScrimBase under your password by any person, whether or not authorized by you. ScrimBase reserves the right, at its own expense, to assume the exclusive defense and control of any matter otherwise subject to indemnification by you, and in such case, you agree to cooperate with ScrimBase's defense of such claim. ScrimBase reserves the right to restrict, suspend or terminate your access to all or any part of ScrimBase at any time for any reason without prior notice or liability. Once your membership terminates, you will have no right to use the ScrimBase. The terms of this Agreement shall survive any termination of your membership. ScrimBase may change, suspend or discontinue all or any aspect of ScrimBase at any time, including the availability of any feature, database, or content, without prior notice or liability. You may not post, distribute, perform, display or reproduce in any way any copyrighted material, trademarks, or other proprietary information without obtaining the prior written consent of the owner of such proprietary rights. Without limiting the foregoing, if you believe that your work has been copied and posted on ScrimBase in a way that constitutes copyright or trademark infringement, please email us at support@scrimbase.com. ScrimBase cannot always anticipate technical or other operational difficulties which may result in loss of data, personalization settings or other service interruptions. For this reason, you agree that the ScrimBase are provided "AS IS" and "AS AVAILABLE". ScrimBase does not assume responsibility for the timeliness, deletion, miss-delivery or failure to store any data, communications or personalization settings. To receive support or have questions answered you can reach out to ScrimBase by visiting our Support section and make a ticket. If you are not registered with ScrimBase you can send an email to support@scrimbase.com.